Previously you had to create your document first before applying your project tags. 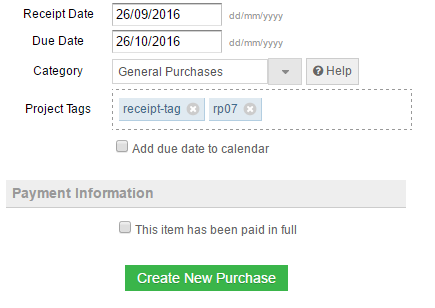 Now you can simply enter your tags inline when you create your invoice, estimate, purchase or purchase order. If you’d like all the invoices you create for a given client or supplier to automatically adopt a common project tag (or set of tags), this can now be configured in the relevant client or supplier settings screen. Default project tags for clients can help you group together the activity for a subset of your clients. This can be useful for sales teams when you need to assign ownership of a client to a particular member of staff and report on profitability. Finally you can also now tag your expenses to a project directly from the Receipt Hub, you will find the new project tagging box just above the “Payment Information” section when tagging a receipt. We have a number of other enhancements in the pipeline to further simplify projects. Ability to apply project tags from bank tagging (this is likely to be an optional feature). If you’d like to see some other specific enhancements for projects, please search the forum to see if it has already been suggested and either add your vote or let us know if it hasn’t been previously covered. I agree that this would make project reporting a little more flexible. I can’t say at this stage how difficult it would be to implement something like this, but we will certainly explore the options. @devologyrob we have explored this previously as it has been suggested by at least one other user. Unfortunately when we last reviewed, we weren’t able to find a way to integrate this, although we’re not completely ruling it out just yet. As an alternative you could potentially use manual adjustments to handle apportioned costs. Ever thought about a premium service where you can guide us during a screen share? There’s a few things I don’t quite get and it would be good to be walked through them. We have considered this, but we just don’t have the resources to manage this right now. I know there are a couple of companies out there offering QuickFile training, I can PM some details to you if you wish? I think in the long term we’d like to work with our existing accountant panel for delivering enhanced support.